Today the CTD (Conductivity, Temperature and Depth) probe went twice to the bottom of the ocean, more than 4500 metres below us. We're also launching Autosub6000 on another mission, at Mount Dent (see 3rd April entry for our latest map of it). Meanwhile we've been trying to find out the source of Mount Dent's name - possibly named after a former Royal Navy Commodore in the Caribbean from the 18th century? 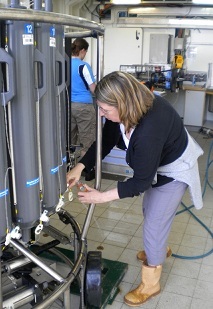 The two dips of the CTD today mean that the chemists are busy, filtering large volumes of water samples in the lab so that they can analyse the particles that they contain. Catching up with Dave Teare, Sea Systems engineer, today we have a look at what's carried on the CTD. 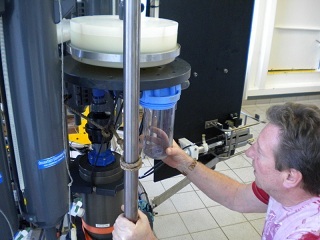 In addition to the collection bottles, we are using a SAP (Stand Alone Pump), which pumps water through a set of filters to collect particles when the CTD is near the seafloor. The CTD we are using is made of titanium - this is because we are measuring trace metals in the water, so using a stainless steel CTD would risk contaminating the samples. The CTD is probably one of the most robust pieces of ocean-going instruments used by the scientists to investigate the deep seas. It collects data and water samples, at various depths, for a variety of purposes. For example: studying the physical structure of the ocean and its currents, the chemistry of the water, and filtering the tiniest organisms to investigate marine microbiology. When the CTD is in action, the ship stays usually stays in the same location. 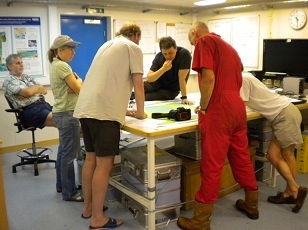 Each deployment of the CTD takes about four hours, so there is a lot of time to plan the next stage of the expedition. After considerable thought, we made the decision yesterday to head for another area to deploy Autosub6000, this time leaving it alone for about 12 hours. Its mission will be to undertake a bathymetric survey (see yesterday for background on bathymetry) of Mount Dent.